With the holiday season quickly approaching finding the best deals can be time consuming, nerve wrecking and cumbersome. What better way to sort through all the sales papers and emails than with a team who'll do the work for you? I’m excited to announce that I’m a part of the HayThere Social Media TweetTeam™ for WDIV Local 4 and clickondetroit.com. Our Team made up of nine bloggers will get you through the holiday shopping frenzy, by finding and sharing the best Black Friday Deals! The TweetTeam™ will share all deals with the hashtag #Local4Shopping on Twitter, so make sure you're following along. Feel free to tweet right along with us just make sure you remember the hashtag! 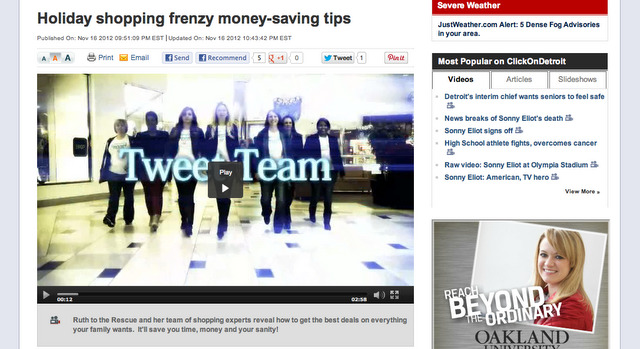 We were featured on the news, be sure to check out the video here. Yours truly even makes a cameo appearance! We also share gift recommendations here. The TweetTeam ™ will save you time, money and most of all your sanity! Join us on twitter now! Compensation was provided for participation.